A follower of EE's Facebook page has just inquired about how to identify the "author" of a database. That prompted another follower to ask whether "author" was the appropriate term for the creator of a database. use their conclusions to create new and original narratives. "When you cite works that fit this description, you need cite only the author's name. [No "role" needs to be stated.] Your readers will take it for granted that you are referencing an authored book." 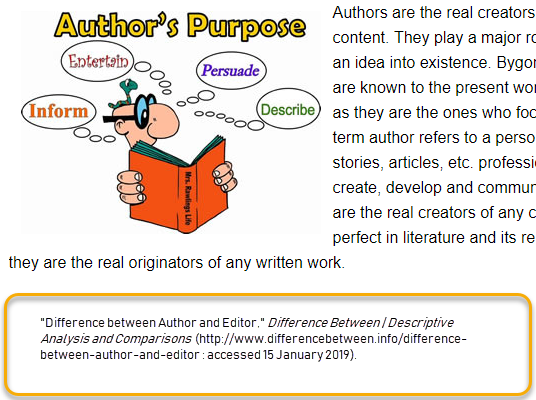 "In library catalogs, the word author is often used synonymously with creator. Many works used by historical writers involve other creative roles, as with abstractor compiler, editor, indexer, translator, and transcriber. (See Glossary for definitions of each.) As a researcher who must analyze every element of a source, you will want to note the exact role of the creator of each published source you use." Now, if you need a refresher course, pull your copy of EE and read the 12.7–12.12 sections. HOW TO CITE: Elizabeth Shown Mills, "What, Exactly, Is an 'Author'?," blog post, QuickTips: The Blog @ Evidence Explained (https://www.evidenceexplained.com/quicktips/what-exactly-is-an-author? : posted 16 January 2019).